Social overlap of the generations. Cooperative care of the young. 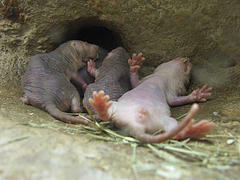 As explained more fully below, Naked Mole Rats fulfill all three of these requirments. 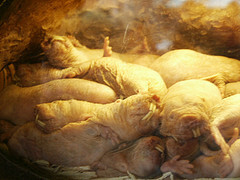 Naked mole rats live in colonies that have an average of 80 members, although colonies with nearly 300 mole rats have been found. 3 This makes H. Glaber colonies the largest of the social Bathyergids. H. Glaber share a burrow system and live togeather throughout the year, and they share the common needs of food foraging, defense, reproduction, burrow maintainence and care of the young. 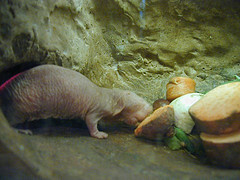 Naked mole rats display limited division of labor between different castes. The largest and most substantiated caste division is between the reproductives and the non-reproductives. Generally only one reproductive female is found per colony, although there have been instances where two females share the position. 8 In contrast, there are up to three breeding males, who often share paternity over the broods of the Breeding female. Divisions within the nonbreeding caste are less well substantiated. Jarvis (81) reported observing three distinct worker castes in her mole-rat colonies. She labeled these frequent workers, infrequent workers ad non-workers. Frequent workers were smaller, and did the lion's share of the work moving food, transporting soil and carrying children. Infrequent workers spend more time resting in the sleeping den, but do work occasionally. Non-workers however spend most of their time in the communal area helping to take care of the young. However, other studies have not been able to confirm these findings. Lacey and Sherman (91) saw behavioral variation amongst non breeding animals to be strongly corrleated with body weight, but not distinct castes. Their findings were similar to jarvis findings, that smaller workers were most frequently involved in food carrying, soil tranport, and collection of nest materials, with larger non-workers appearing lazier. However, larger animals are the colony members that were most likely to be involved in volcanoing and new tunnel construction. 9 Furthermore, when presented with intruders like snakes, larger nonbreeders were the primary participants in defensive activities. 10 As volcaoing is the most likely time for predation events to occur, this suggests that larger individuals frequently are found not working because they are saving their strength for the more energy demanding activities involved with burrow defense and expansion. Assuming there are castes, there is some evidence suggesting that H. glaber displays age polyethism. Jarvis ('81), still working in the assumption of distinct castes, suggested that all newborns, once weaned, enter into the frequent worker caste. Faster growing mole-rats would quickly attain larger size and move into the infrequent worker caste, whereas slower growing mole-rats would continue in the frequent-worker caste, permanently. 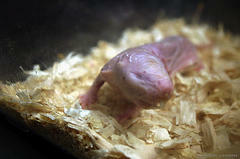 Faster growing mole-rats also may go on to become breeders when the current queen dies. This is similar to what has been found about Damarland mole-rats. Other researchers have found less clear cut answers. Using different tests to determine dominance, such as tugging on food, some researchers have come up with differnt domiance patterns, that are very non-linear. 13 However it has been suggested that these differing findings may be a result of the different tests used to determine dominance. One thing that is clear is that an individuals social status is not fixed once individual attains adulthood. The queen is almost always considered to be the most domiant individual in the colony, however replacement of the queen generally comes from within the colony, so it is clear that the social rank of adults changes changes. These adaptations make sense in the light of the fact that 1) the morphological changes undergone by those in the defender group presumably dont impact the ability of an animal to change social role and 2) the role of breeding female is the last role a individual will ever attain, so the morphological changes that she undergoes will not affect her ability to hold other social roles. The common ancestor (Bathyergidae) of the mole rats was probably solitary, given that most subterranean mammals are, but there is some argument over this. The trait of being social could just as easily have been lost in many of the modern day species that are solitary. Comparative studies have been inconclusive as to whether this trait was gained by the mol-rats, or if it is left over from their ancestor. Eusociality must have been developed at some time, though. The original thought was that it appeared in naked mole-rats due to inbreeding which resulted from the lack of dispersion. But the Damaraland mole-rat, which is an out-breeder, also displays eusociality. Instead, eusociality seems to arise from the environmental constraints of high habitat saturation. © 2006 Doug and Deyo | Last updated: 4 December 2006 | Contact | Design by Ginger Ninja!